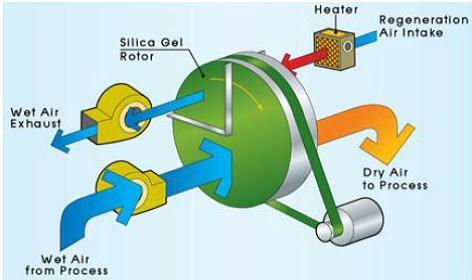 • Rotary desiccant dehumidifier with heat recovery. 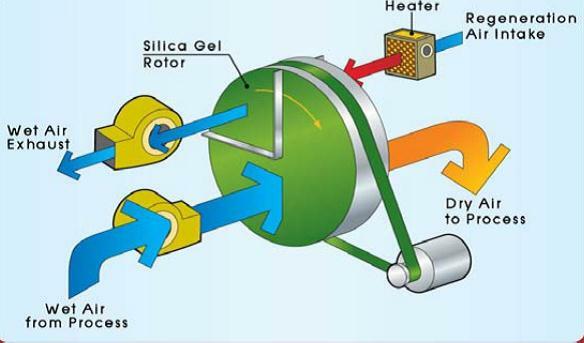 Energy saving with installation of Desiccant Dehumidifiers, it will depend on the application of each situation. Therefore, selecting of dehumidifier system shall require cost saving comparison incurred with Desiccant Dehumidifiers and other system. In addition, It must also take into account the area of installation, temperature and humidity requirements and other alternatives of Desiccant Dehumidifiers. At present, Desiccant Dehumidifier has developed into high performance by using Liquid Desiccant instead of the old system. It is operated by working in conjunction with heat pumps to reduce energy consumption with regenerator before bring the desiccant to be reused. 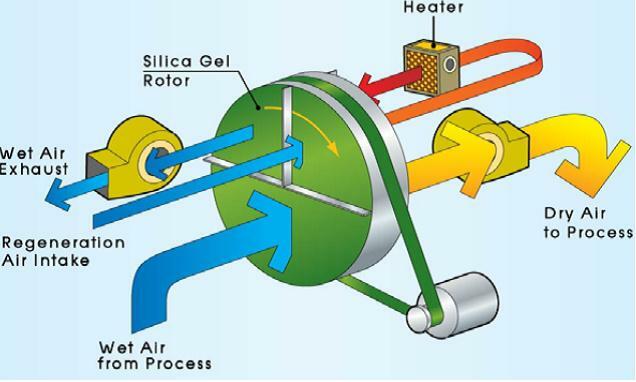 It utilized LiCl solution to remove moisture from the air and use a heat pump draws heat from the air to draw the moisture from the desiccant. Replacement of the old technology. It controls humidity levels below 40% RH by replacing the desiccant wheel and use Electric Heater or Steam Heater to increase the air temperature to remove moisture out of the desiccant. There is no environmental impact because the use of desiccant are not toxic and harmful to the environment. Also, the technology is designed to help reduce energy consumption and reduce emissions of greenhouse gases.